For November, the average contiguous U.S. temperature was 40.1°F, 1.6°F below the 20th century average, ranking in the coolest third of the historical record. 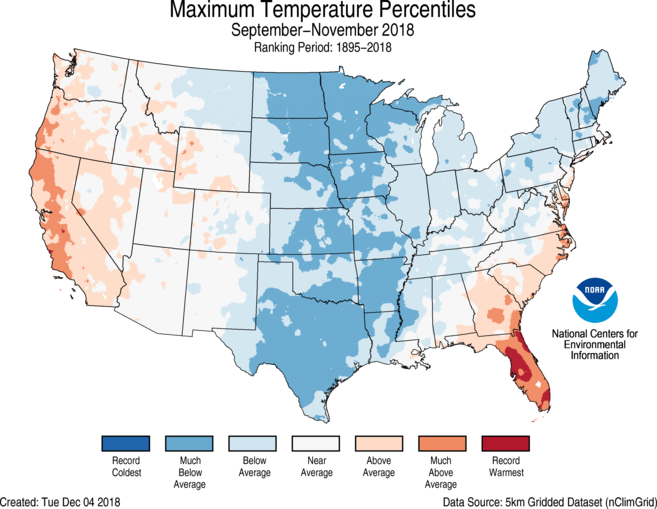 Below-average temperatures stretched from the Great Plains to the East Coast, with above-average temperatures along the West Coast and in Florida. 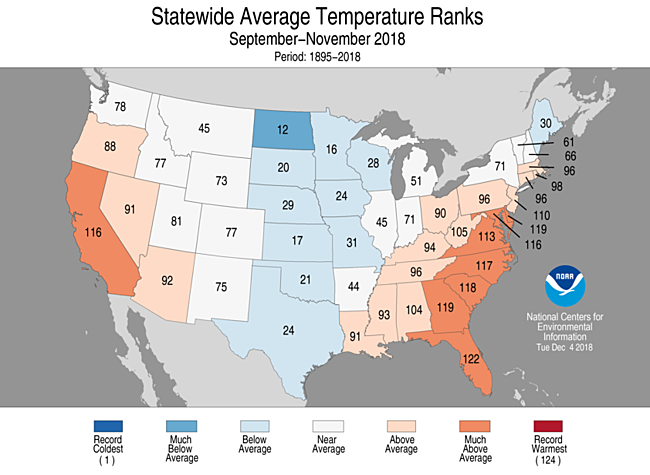 During meteorological autumn (September–November), the average temperature was 53.8°F, 0.2°F above average, ranking near the middle value in the 124-year period of record. 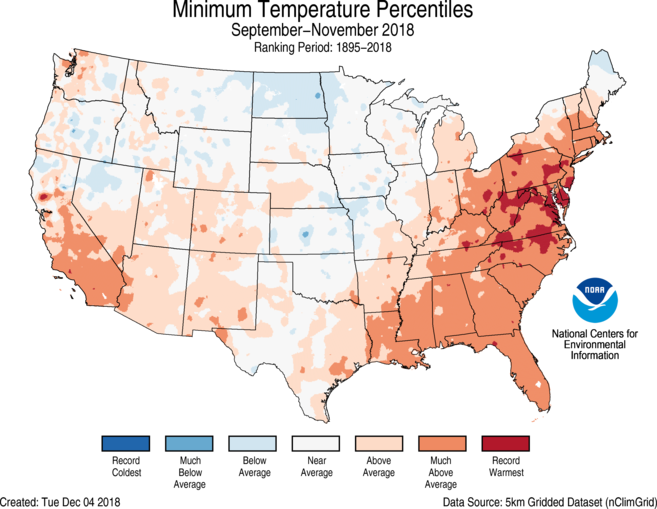 For the year-to-date, the contiguous U.S. temperature was 55.2°F, 1.4°F above the 20th century average and was the 16th warmest January–November on record. This was the coolest January–November since 2014. 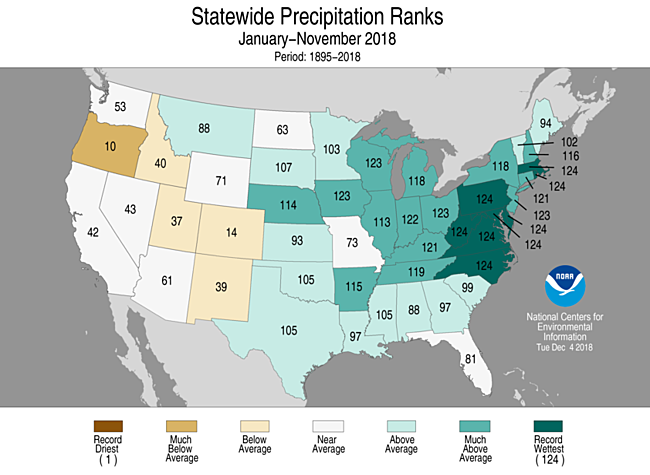 The November precipitation total for the contiguous U.S. was 2.64 inches, 0.41 inch above average, and ranked in the wettest third of the 124-year period of record. Much-above-average precipitation accumulated in the East, with record totals in parts of the Mid-Atlantic and Northeast. Below-average precipitation fell in the Northwest, Southwest and parts of the Southern Plains. The autumn precipitation total for the contiguous U.S. was 9.61 inches, 2.73 inches above average. This was the second wettest autumn on record, behind the 9.72 inches that fell in 1985. For the year-to-date, the national precipitation total was 31.31 inches, 3.72 inches above average. This marked the fifth wettest January–November on record and wettest since 1998. Below-average temperatures impacted most locations from the Great Plains to East Coast with much-below-average temperatures in the Midwest to south-central United States. Some locations observed their coldest November on record, including Kansas City, Missouri. The city’s average temperature was 35.6°F, 8.0°F below the 1981-2010 normal. There is reliable data for Kansas City dating back to 1888. On a statewide level, Arkansas, Illinois, Mississippi, Missouri and Oklahoma each had a top 10 cold November. 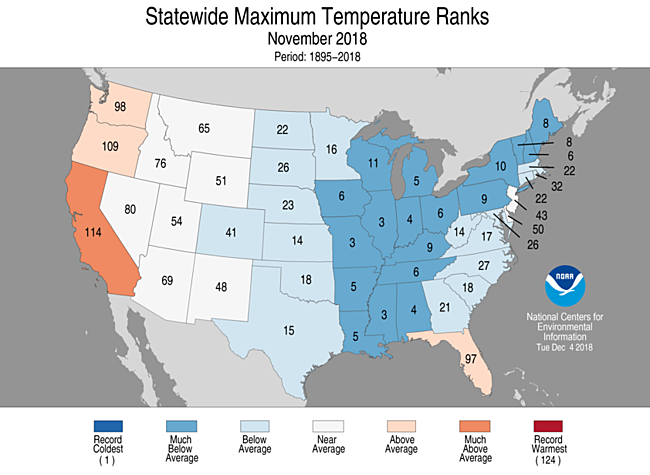 Afternoon high temperatures were much colder than average for most locations east of the Rockies with 17 states having a November maximum temperature that ranked among the 10 coldest. Averaged across the entire contiguous U.S., the maximum temperature was 50.3°F, 2.4°F below average. This was the coldest maximum temperature departure from average for any month since November 2014. 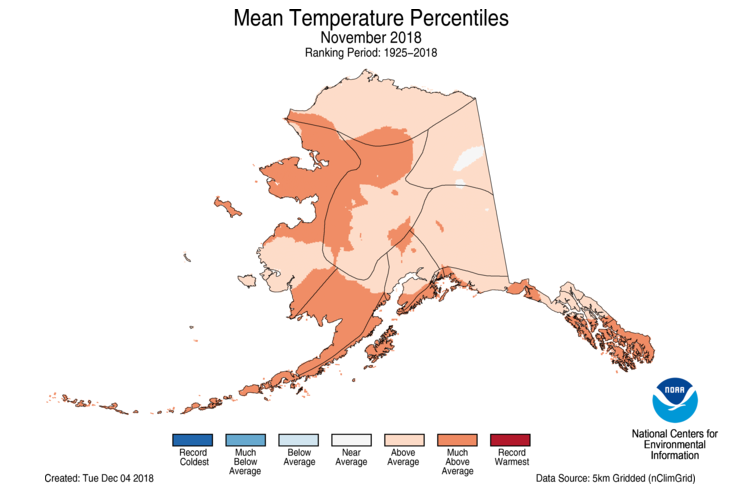 Alaska had its seventh warmest November on record with an average temperature of 19.3°F, 7.6°F above average. Much-above average temperatures were observed across western and southern parts of the state. Much-below-average sea ice was also observed off Alaska’s west coast in the Bering Sea. Above-average precipitation fell across the East, Northern Plains and parts of California. The majority of the precipitation in California fell late in the month assisting wildfire containment efforts. 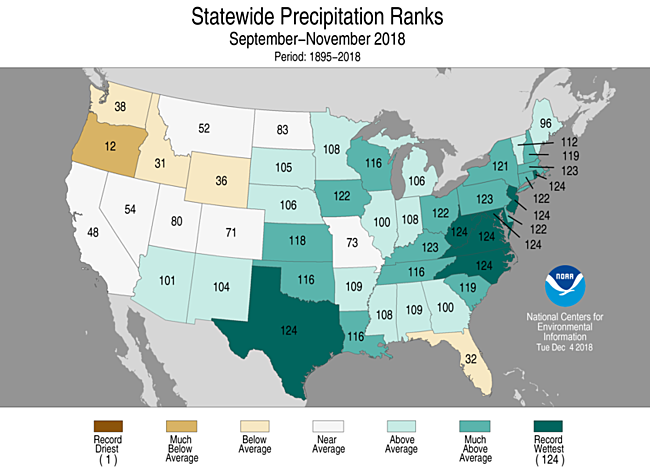 In the East, Delaware, Maryland and Massachusetts were each record wet with 13 additional states having monthly precipitation totals that ranked among the 10 highest on record. According to the December 4 U.S. Drought Monitor report, 22.1 percent of the contiguous U.S. was in drought, up slightly since late October. Drought conditions improved across parts of the Mountain West, Great Plains and Northeast. Drought conditions worsened in parts of California, the Great Basin and in Florida. Severe drought continued to impact the Alaskan Panhandle and abnormally dry conditions expanded in Puerto Rico and Hawaii. Two large and devastating wildfires impacted California in early November when high winds interacted with long-term dryness and above-average temperatures creating ideal fire conditions. The Camp Fire burned more than 153,000 acres in Northern California, near Chico. The fire destroyed more than 18,000 structures and caused at least 88 fatalities with the town of Paradise being the hardest hit. This marked the most destructive and deadliest wildfire on record in California and the deadliest wildfire in the U.S. since the Cloquet Fire in 1918 killed 453 people in Minnesota. The Woolsey Fire destroyed more than 1,500 structures and caused at least three fatalities in and around Malibu. Above-average autumn temperatures spanned both coasts with below-average conditions across the interior. Most of the warmth in the East occurred early in the season, with the West consistently warmer than average. Seven states had a seasonal temperature that ranked among the 10 warmest, while North Dakota had its 12th coolest autumn. Maximum temperatures were particularly cool across the Great Plains, Midwest and Northeast. Seven states had a top 10 cold autumn maximum temperature. Minimum temperatures were above average in the West, South and East. 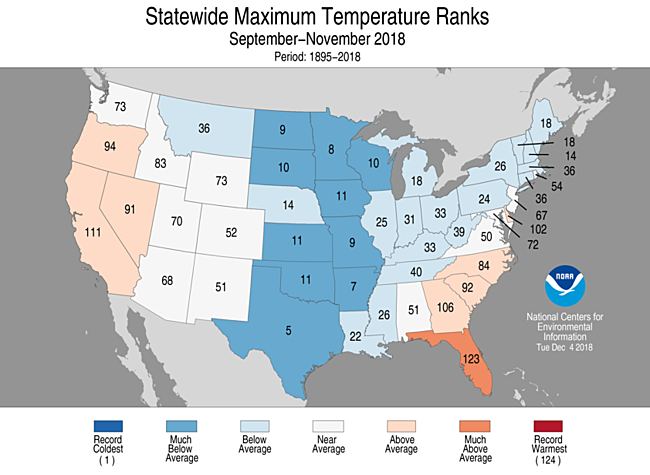 Delaware, Maryland and West Virginia each had record warm autumn minimum temperatures with 15 additional states having top 10 warm conditions. The Alaska autumn temperature was 32.4°F, 6.5°F above the long-term average. This marked the second warmest autumn on record for Alaska, behind 32.9°F that occurred in 2002. Record warmth was observed across western and southern parts of the state. Many towns, including Anchorage, Bethel, Nome and Cold Bay, had their warmest autumn on record. The above-average temperatures limited snowfall with only 5.3 inches accumulating in Denali National Park, the lowest autumn total since 1943. Above-average precipitation fell across many locations east of the Rockies. 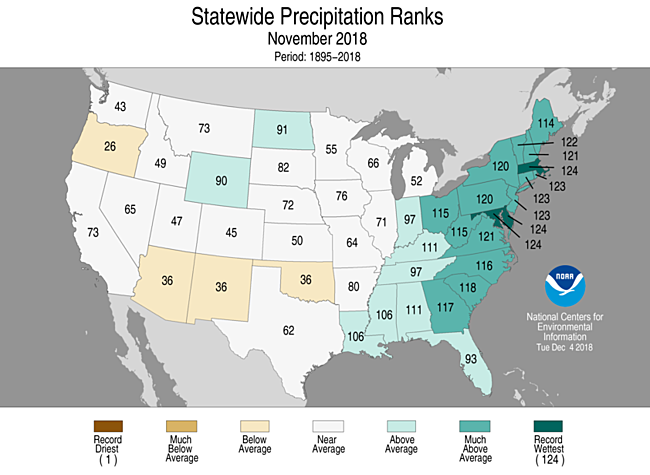 Maryland, New Jersey, North Carolina, Rhode Island, Texas, Virginia and West Virginia each had their wettest autumn on record. Fifteen additional states had a top 10 wet autumn. Drier-than-average conditions were observed in the Northwest and in Florida. Locations along Florida’s Atlantic Coast were record dry, including West Palm Beach. 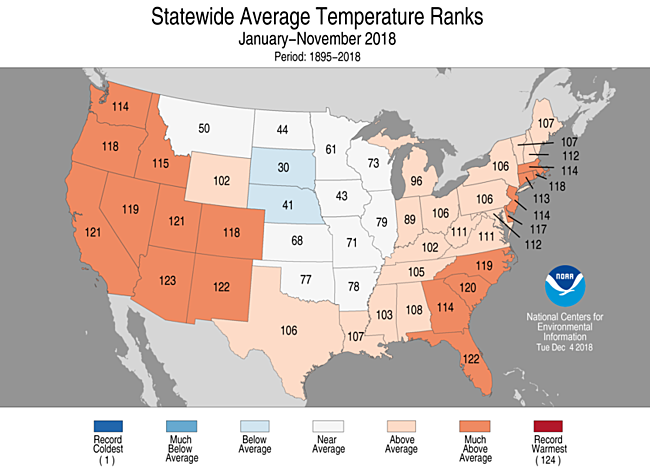 Above-average temperatures were observed across the West and East where 13 states had a top 10 warm January–November. Alaska had its third warmest year-to-date on record. Near- and below-average temperatures were observed across the Central and Northern Plains to the Upper Midwest. No state had a record warm or cold year-to-date. Above-average January–November precipitation fell across most locations east of the Rockies. Eight states from the Mid-Atlantic to Northeast were record wet with near-record precipitation totals observed into the Midwest. Below-average precipitation stretched from the Northwest to Southwest, with Oregon having its 10th driest year-to-date on record.